Deadlier Than the Male is a 1967 British film featuring the character of agent Bulldog Drummond (Richard Johnson), which is assigned to stop a master criminal Carl Petersen (Nigel Green), who uses beautiful women to do his killings. Hugh 'Bulldog' Drummond (Richard Johnson) uses a Walther PPK as his sidearm. 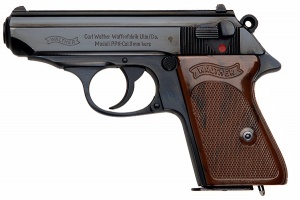 Walther PPK - 9mm Kurz aka 9x17mm (.380 ACP). 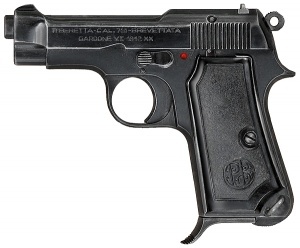 Bond's model was the 7.65 mm (.32 ACP) but this PPK better illustrates the brown grips. Several characters in movie wears the Beretta M1934 pistols. 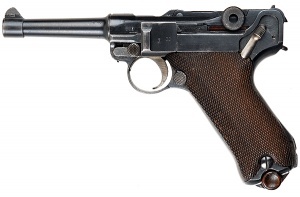 Beretta Model 1935 , the .32 ACP version of the Model 1934. Carl Petersen (Nigel Green) fire a pistols at Drummond. One of King Fedra's guard aims his gun on Irma and Penelope. Drummond's brother Robert (Steve Carlson) holds a Luger P08 in his hand. The Smith & Wesson Model 10 is equipped the man on the beach. Petersen´s women-bodyguards (left is Yasuko Nagazumi) carry a German MP40 SMG. One of Petersen's henchmen is armed by the MP41 submachine gun. Irma Eckman (Elke Sommer) by shot from a tranquilizer Diana 5G Air Pistol eliminates the witness on the street. Irma Eckman (Elke Sommer) assassinate top oil executive in his private jet by the shooting cigar. Irma (Elke Sommer) and Penelope (Sylva Koscina) use a spear gun to kill the man on beach.